You get a new listing, a very nice listing, you need activity immediately, and more specific, you need it from the correct class of buyer. The property is unique therefore you must get it in front of buyers who are just as unique. The key to offering an effective direct mail solution to Texas and Oklahoma brokers and agents who sell recreational properties is to understand the buyer’s needs, their habits, their hobbies, their roots, and most important, what they are capable of buying. The quality of the list is key to the overall success and its why TRE will drive more new buyers to your phone and to your online portals than anything you have ever invested in before. Direct mail is the gold standard in marketing, and for good reason. Nothing puts you into the buyer’s domain better, or more effectively, than direct mail. All buyers act on information, whether they are seeking it, or, it is presented to them. If they have an appetite for what you have then they will act on the right information that is presented to them in the absolute best way. Just ask yourself, if you receive something in your mailbox that is unique and catches your attention, in most cases you put it aside to take a closer look. Or, you begin looking at the information immediately. Many believe that most mail is “junk mail” but again, think about how you process information overall, and then make a comparison to direct mail that hits your mailbox. It is more important and potentially more valuable, right? it’s all about the list. To get the best list we worked with several large national mail list companies until we found the one who had the data capability to meet our challenging needs. We believe that the list we have developed truly hits the “sweet spot” for the absolute best profile for being the “typical” or “best” buyers for the properties you have. By having your properties featured in Texas Real Estate magazine you are exposing them to over 10,000+ prospective buyers who are identified as meeting the criteria we have established as well as a strong social media presence (over 7,000 Facebook followers) and a high-quality website. Results are all that matter in advertising and we believe Texas Real Estate has the plan to bring you unprecedented numbers of buyer leads each month. LETTER FROM THE PUBLISHERS Why Direct Mail Will Change Your Mind Every form of advertising that you do today is based on waiting for a reaction from a potential buyer. Whether it’s finding your listing by driving by a sign you have on a property or waiting for an online property search to deliver your listing, either way, it is a waiting game. Direct mail changes the game, through Texas Real Estate you now have the ability to present your listing to 10,000+ buyer households every month, no waiting, just action. Our list totals over 160,000, each month, we will be mailing to 1/16 of the list so that each month your properties are in front of a completely new group of buyer prospects who fit our mailing profile. Our research has provided us insight as to the actual number of individuals who fit what we call the “sweet spot” of buyer income, financial assets, and propensities. You might think the number would be greater, but, 160,000 actually follows national data on wealth concentration per capita. In all areas Texas Real Estate magazine will be mailed there is roughly 7 million people, if 2% of those 7 million fit our income and propensity profile, as national data would suggest, the total would be approximately 160,000 people who would be optimal to mail to. Right now, our list is pulling 160,000, we believe that our list is very accurate especially when compared to these national statistics. There is a big difference between “subscribers” and “high value recipient’s”, allow me to explain. There are a few other subscriber-based products or publications in the market today, and while having a subscriber base to pass information to is fine it does not always mean you are sending the information to the most actionable group of people. Alternatively, sending information to a group of people you know has the resources, interest, and history of acquiring the products or services you are offering is quite frankly, a game changer. The debate about print vs. online marketing will continue, we believe both have their place and that both are effective, but it is not about choosing one or the other, it’s about choosing both. The challenge for print is to be as relevant to the buyer as online information, so, print must do things and be in places that online cant. The mailbox is a perfect example. By direct mailing Texas Real Estate, we will be introducing information to thousands of buyers each month who might not have ever spent the time to know the extent of the inventory that was available to them, or, that existed. Presenting information in relevant formats and relevant locations like the mailbox is what print can and will do to make you more money this year. 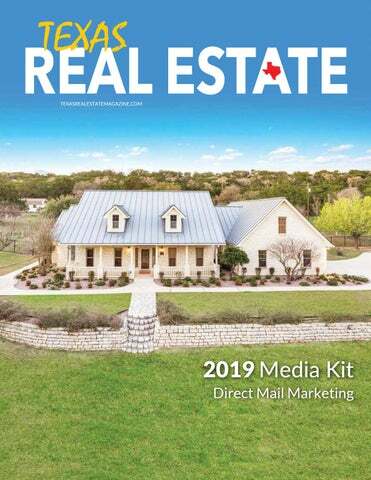 TEXAS REAL ESTATE TARGETED BUYER DIRECT MAIL Texas Real Estate magazine will begin mailing 10,000+/- magazines each month from a master list of over 160,000 to targeted buyers in west, central, north, east and The Hill Country of Texas beginning with the May 2019 issues of Texas Real Estate. NEW FORMAT: To maximize the benefit to all advertisers Texas Real Estate will discontinue the separate west, central, Hill Country and north, east, Oklahoma editions and create a single Texas Real Estate edition that encompasses all our previous regions into one new edition. THE BENEFIT: Over the past two years we have been involved in several direct mail endeavors that has given us the basis and knowledge to enable us to develop a list of potential buyers who we believe will give our customers a greater return on their advertising investment each month. No other advertising media that represents Texas recreational property buyers will be able to match the results that direct mail marketing will produce. We will no longer be waiting for action from buyers, instead, we will be creating it each month by putting TRE in the hands of the most qualified and highest propensity buyers in the market. HIGH INTEREST HUNTING / ALL TYPES: Individuals and families who have a demonstrated association to hunting in Texas and who have actively pursued their hunting interests through various subscriptions and hunting related activities, purchases and inquiries. HIGH INTEREST RANCHING: Individuals and families who have, or are likely, to pursue ranching activities by showing strong interests in cattle, equestrian, and various livestock associated organizations including ranching property ownership. HIGH INTEREST FARMING / AGRICULTURE: Individuals and families who are engaged in farming and agriculture related industries including active farming operations. Individuals and families who participate in agricultural related organizations. HIGH INTEREST IN REAL ESTATE INVESTMENT: Individuals and families who are active investors in rural recreational property and who have demonstrated their interest in investment grade properties by their previous purchasing history and current property ownership. HIGH INTEREST IN RETIREMENT RELOCATION: Individuals and families who are about to make a relocation decision as indicated by their age, social/economic profile, and current residence location as weighted against local, state, and regional statistics that indicate a high likelihood of relocation at or prior to their retirement. HIGH INTEREST IN LAKE / WATER PROPERTIES: Individuals and families who have a strong interest in vacation and or permanent purchase and or relocation to lake / water related properties and who have demonstrated their interests by their association to various fishing and water related activities including water craft and boat ownership. Premier Properties Program Our new website will enable our customers to showcase their listings on an unlimited basis, meaning that you won’t be limited to only what you are featuring within your print ad, now the sky is the limit, you can put all of the listings you have on the TRE website. So what’s the number one feature of the new site? You will be able to link your best listings, or, the ones you need the most activity quickly on, directly to your print ad. Premier Properties E-blast As a TRE advertiser your properties are automatically included in our weekly marketing e-mails. Each Wednesday we select five to six featured properties and then send the information to 4500+ brokers and agents who specialize in the types of properties that are shown in the e-mails and who are located throughout Texas and Oklahoma. The Premier Property e-blast is an immediate lead generating tool that continues to be very effective in creating urgency for high profile listings. Custom e-blasts using our e-mail list are also available. See your sales representative for pricing and complete terms. Check Us Out On Facebook Our daily property postings on our Facebook page are drawing strong likes and sharing. We post daily property updates, which are viewed by our 3000+ Facebook followers. If you have listings that you need to move TRE will create sales leads faster than anything else you could use. AD REQUIREMENTS Non-Digital Artwork 1.) Line art furnished, such as logos, should consist of a solid black image on a smooth white background and be close to the size that it will be used. 2.) Color images from a laser or inkjet printers are not recommended. Business cards, Fax copy or newspaper clipped logos are not recommended. Digital Media - Page layouts from another source (Design Agency) are accepted. The media can be submitted by these formats: 1.) PDF - Adobe Acrobat 2.) .tiff /.eps - The following are specifications on page size for the “live area” for Texas Real Estate magazine: • Full Page: 7.625 (width) x 10.125 (height)	• 1/2 Page: 7.625 (width) x 4.9375 (height) • 1/4 Page: 3.653 (width) x 4.9375 (height)	• 1/8 Page: 3.65 (width) x 2.406 (height) * Bleeds are only acceptable for the back cover page. - Digital media can be submitted by the following: 1.) CD 2.) Email - files that exceed 4 mega bites may have difficulty transferring through the mail server. Please compress files with: stuff it (mac) or winzip (pc). Credit / Payment Terms We do not require, or ask, for credit applications from new customers. Unless noted, all accounts are billed with net 15-day payment terms. 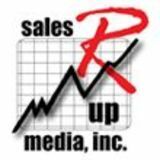 sales R up media, inc.